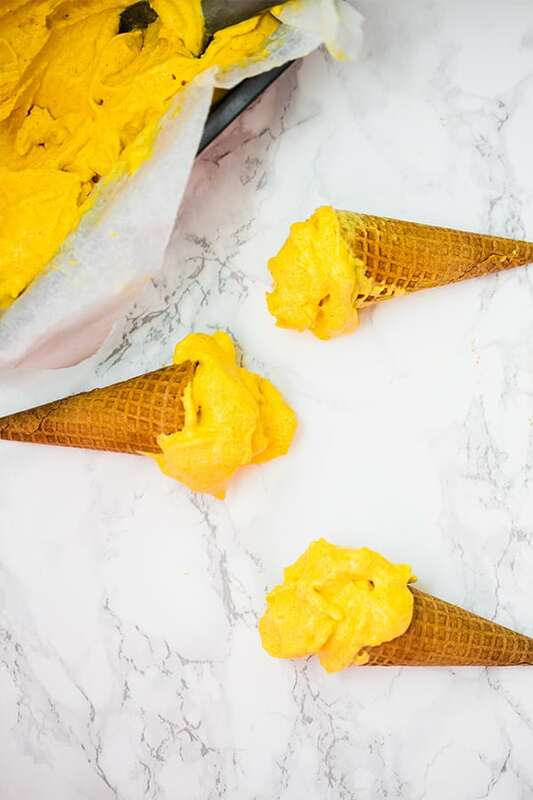 This no-churn mango turmeric ice cream is the perfect summertime treat! It’s made with real food ingredients, no dairy, and no added sugar. This recipe originally appeared on Unbound Wellness in 2016! It’s back with new photos and a slight new an improved recipe. I think it’s pretty safe to say that I’m obsessed with turmeric. After I started making my coconut turmeric bites, and my iced turmeric latte, I decided to branch out and see what else I could add it to. So there I was, standing in front of my fridge trying to find the perfect combination when I saw the frozen mango in my freezer. “Well… they’re the same color…” I thought, “it may work.” Oh, and it did. Living in Dallas, TX in the summer is… well… it’s a bummer. It’s brutally hot here in the summer, so frozen fruit and fruit and veggie popsicles are some of my favorite treats this time of year. 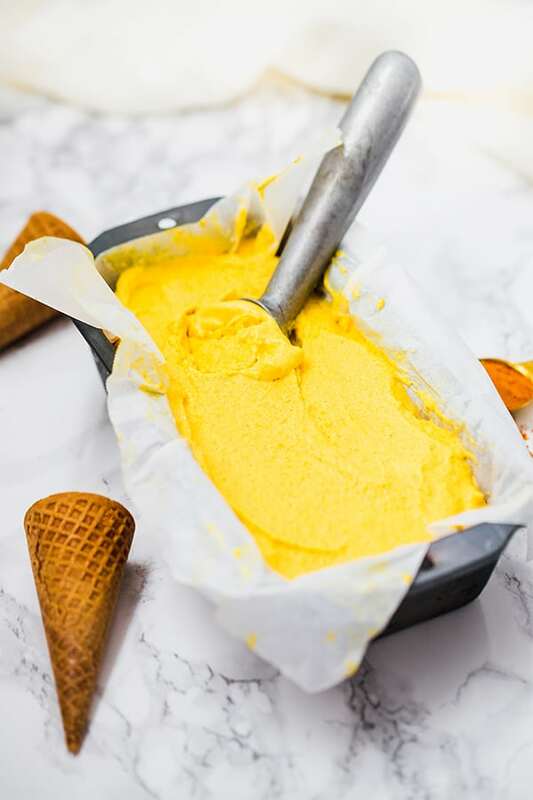 Though I love turmeric in broth, and in other warm dishes like cauliflower rice, I was really craving a way to make turn it into a cold treat. I requested a lot of kitchen appliances and accessories on my wedding registry last year. Like, entirely too many. I had a donut pan on there, gargantuan mixing bowls, and even a foreman grill. One of the appliances that I was especially hopeful for, but sadly didn’t get was an ice-cream maker. What with not being able to have dairy and all, I really wanted to have an ice-cream maker to make my own coconut ice-cream and have it not cost an arm and a leg. But when there’s a will there is a way! With some patience, a high-speed blender, and the right balance of ingredients, this ice-cream can be yours without an actual ice-cream maker! Turmeric has great flavor and is known for its anti-inflammatory qualities. 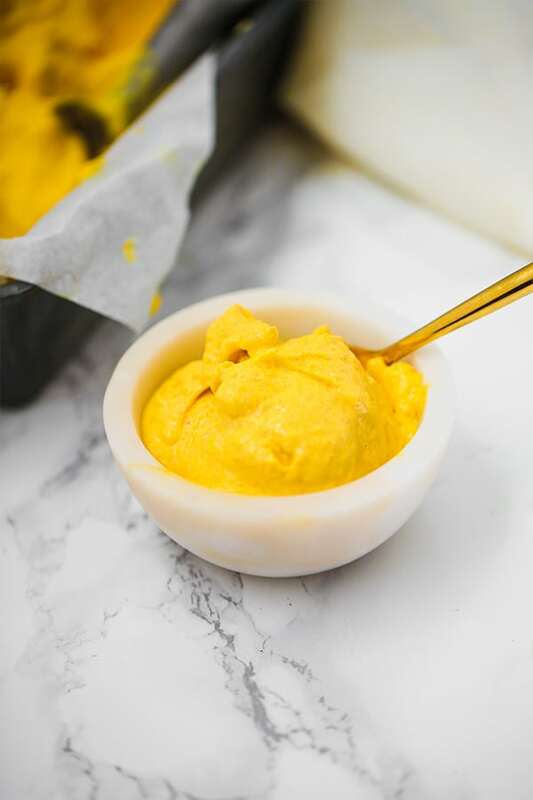 Turmeric is a member of the same family as a ginger (another great, natural anti-inflammatory ingredient) and has been shown in many studies to reduce pain, and inflammation in those with chronic joint pain, and even RA. Are treats still okay if you’re dealing with inflammation? That being said, every person has their own threshold. Many people dealing with serious inflammation are best off avoiding sugar, even natural sugar like mango. We’re all bio-individuals and what works for one person may not work for the other, and so forth. For someone like me who has Hashimoto’s disease and has done tons of gut healing and reduced my antibodies to normal, I do fine with the occasional treat here and there. How can you have treats that are more balanced? As always, it’s important to remember that moderation and balance is key. Our modern diets are inundated with processed sugar and refined carbohydrates that result in terrible blood sugar handling. As a nutritional therapy practitioner, nearly every single one of my clients is dealing with a sugar handling issue when they come to me. Though they may believe that their biggest problem is energy, hormonal acne, or thyroid problems, the root cause is often their blood sugar. Poorly regulated blood sugar is a global problem and far beyond just those who are diabetic. Poor blood sugar regulation can result in hormonal imbalance, increased intestinal permeability, gut bacteria imbalance, digestive issues, mood and energy problems, and you guessed it… inflammation. Think outside the box… savory foods can be treats too! Bacon, anyone? Use natural sweetener like fresh or frozen fruit, local honey, or maple syrup. Add a good fat source to your treats to balance the sugar absorption. All that being said, that’s why I used full fat coconut cream and milk for this recipe. 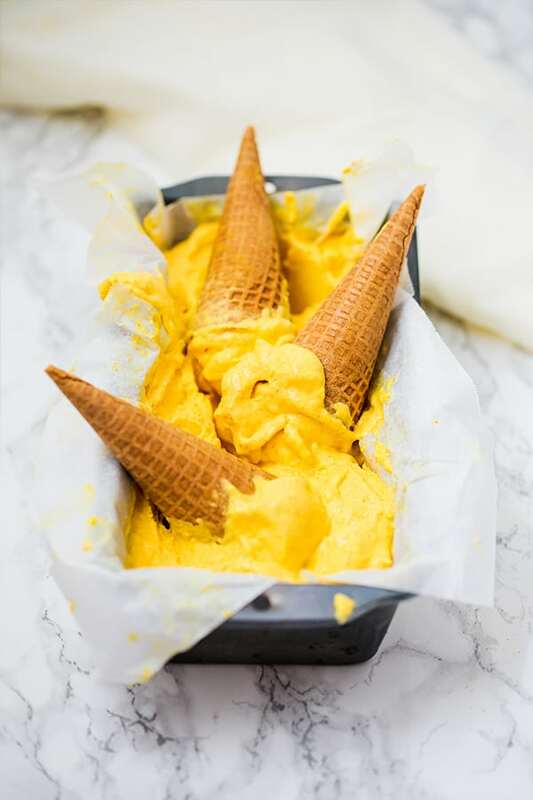 The fat from the coconut can help balance the metabolism of the sugar from the mango, as well as make the turmeric more bio-available, and make the ice-cream more satiating! You can either buy the frozen mango from the store or just freeze your own. This makes the ice cream creamy! You can place a can of coconut milk in the fridge overnight to let the coconut cream harden, or you can use this, which I prefer! Full fat coconut milk without additives like this is the best option for this recipe. Using a high-speed blender, blend all of the ingredients on med/low speed until combined. Once combined and not chunky, add to a glass Tupperware or parchment lined loaf pan and place in the freezer for at least 1-2 hours (see notes for freezing longer). Use an ice-cream scoop to add to a bowl, or serve in a compliant ice cream cone (see above) and enjoy! TIP: This ice-cream freezes solid if you keep in the freezer for multiple days. I shot these photos about an hour after making it and freezing it, so the consistency will vary by how long you’ve had it in the freezer! 🙂 I like leave it out on the counter for 10-20 minutes or so to melt a bit to make it easier to scoop/eat! Have a sweet summer, friends! Where do you find coconut cream? I love the idea but not the taste. Ruined my yummy mangoes. I’d rather swallow a pill of turmeric than put it in mango ice cream. The mango ice cream without the turmeric would get 5 stars from me. But I did try it.